The more I play Rare Replay the more I can’t help marvelling at how refreshingly ballsy Microsoft has become over the past two years. Literally announced and released atop of some recent, major sea-changing Xbox One backwards-compatibility announcements at E3 2015 and Gamescom 2015 respectively, this massive anthology of Rare games is two fantastic things at once. First, it’s auspicious: 30 Rare games in a collection that proudly commemorates Rare’s 30 years in the industry for the low price of $30 CAD, precisely at a time that Microsoft has been publicly refocusing its efforts on games and new original IP (including Rare’s recently revealed Sea of Thieves). For Microsoft, that’s the equivalent dropping the mic, walking off stage backwards with arms outstretched and saying, “What you got, Sony?” Second, it’s clever: with over a third of its included titles requiring Xbox 360 emulation in order to be played, Rare Replay provides an inexpensive early taste of the Xbox One’s new backward-compatibility feature for everyone, which otherwise is only available to gamers in the Xbox One Preview program and is set to roll out for all Xbox One owners in November—giving gamers plenty of reason to check it out. Message received, Microsoft. So, is Rare Replay worth revisiting on Xbox One for the first time? As mentioned earlier, Rare Replay is a celebration of Rare’s 30 years in the art and business of making interactive entertainment. In trademark tongue-in-cheek fashion, Rare has literally taken this theme and run with it, presenting the collection as a classic stage variety show (think vaudeville), where the games are the evening’s performing acts. Rare even went as far to create a CG intro to this effect, complete with its own Muppet Show-like theme song. Meanwhile, the interface for selecting the game you want to play is the equivalent of walking through an art gallery while observing portraits hung on the walls, which are in turn themselves windows to smaller performance stages showcasing each title using game footage, original art assets, and sprites. The whole production seems a bit confused thematically as to what it ultimately wants to be. From a functional UI standpoint however, it works, and there are other nice touches as well. Every game’s main theme song has been updated and remastered for its respective “stage” (i.e. intro screen), and the previously mentioned art assets and game footage backdrops create animated papercraft sequences that visually recapture the essence of the game you are about to play. Old 8-bit games such as Jetpac and Cobra Triangle feature useful cheats and tricks in their options menu, such as infinite continues, CRT scanline filters, and the ability to toggle on/or off rewinding up to 10 seconds of game progress at any time by using the left analog stick. Finally, achieving certain milestones in the game will award players with stamps on their “admission ticket” that unlock various extras, including behind-the-scenes footage and concept art. And for completionists, “snapshot” and “playlist” challenges will have players chasing both Rare Replay and/or in-game achievements for hours on end. Regardless of how long you’ve been gaming on Xbox consoles, the early 8-bit games in the anthology will likely feel the freshest by far, as many of them have never been released on the Xbox platform before. Depending on how long you’ve been gaming, you may never have even had the opportunity to play some of them unless you had a working ZX Spectrum, Vic 20, or Commodore 64 computer in your home. Of course, as is the case with many “golden age” titles, your of mileage these games will vary depending on the amount of love and appreciation you have for their old-school visuals, sounds, and rudimentary gameplay. Surprisingly, even as a former child of this era, I found Rare’s early entries, such as Jetpac, Atic Atac and Slalom (Rare’s first game for the NES) pretty difficult to stomach in all of these areas, and the difficulty (without using the infinite lives cheats that only some of 8-bit games provide) almost ensured that that they would not hold my attention for long. The initial disappointment was quickly washed away, though, as soon as I chose to revisit my old NES rivals, R.C. Pro Am, Cobra Triangle and Battletoads; three games that, in my opinion, established Rare’s vibrant graphical style and penchant for solid, addictive gameplay early on in the developer’s history. They all sound and play exactly as I remember them, and are all as unforgiving as they were back in the day as well. Yet somehow, just knowing that I could go into the options of either of the latter two games and toggle on infinite lives if I needed allowed me to keep my composure and avoid the controller-throwing incidents of my youth. On a related note, how I went through life without playing R.C. Pro Am II (also in this anthology) on the NES is a mystery. Better graphics, upgradeable vehicles, 4-player action, and thanks to Rare Replay, infinite continues. What’s not to like? The anthology picks up steam in the 90’s with Battletoads Arcade (previously never released on a home console; most likely in part to its shocking amount of blood, gore and toilet humour) and a murderer’s row of games from Rare’s output on the Nintendo 64: Killer Instinct Gold, Blast Corps, the first two Banjo-Kazooie games, Conker’s Bad Fur Day, Jet Force Gemini and the original Perfect Dark. While a number of these games have been released on Xbox consoles in the past in some form or another, the opportunity to own and play all these titles on Xbox One (complete with Achievements and other extras) makes Rare Replay worth the cost of admission alone, especially if you’ve never owned a Nintendo 64. Finally, Rare Replay closes the show with the lion’s share of the developer’s output under the Microsoft first-party banner, including Grabbed by the Ghoulies, Kameo: Elements of Power, Perfect Dark Zero, both Viva Piñata games and Banjo-Kazooie: Nuts and Bolts. 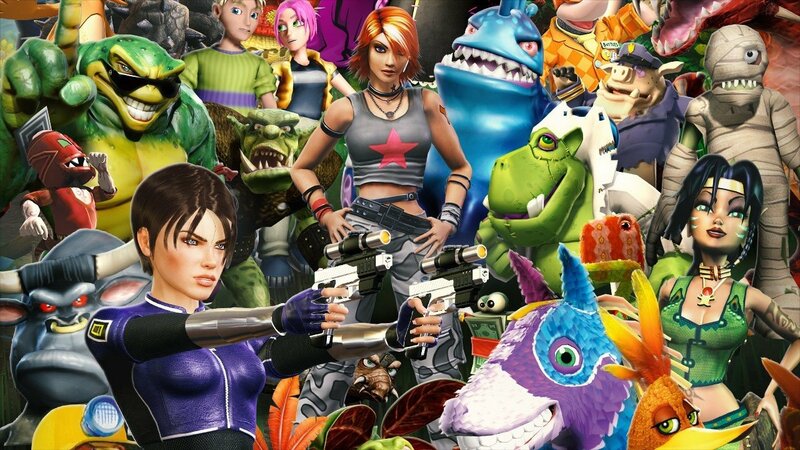 This last group I personally consider to be the unsung heroes of the collection, as they are likely to be overlooked by many Xbox gamers due to the fact that most have already been on the Xbox Live Marketplace for years, look exactly the same, and offer no new Achievements outside of those built in to Rare Replay’s UI. In other words, if you’ve already played any of these games on Xbox 360 and unlocked any in-game Achievements in them, those Achievements will already be unlocked in Rare Replay as well, which will be a bit of a damper for players looking for ways to boost their Gamerscore. Likewise, if you already own any of these games for Xbox 360 either digitally or physically, they will automatically be unlocked to download for free on your Xbox One (disc owners will obviously need to insert the 360 disc in order to play the digital version), slightly diminishing Rare Replay’s overall bang-for-the-buck if you are an avid Xbox collector. 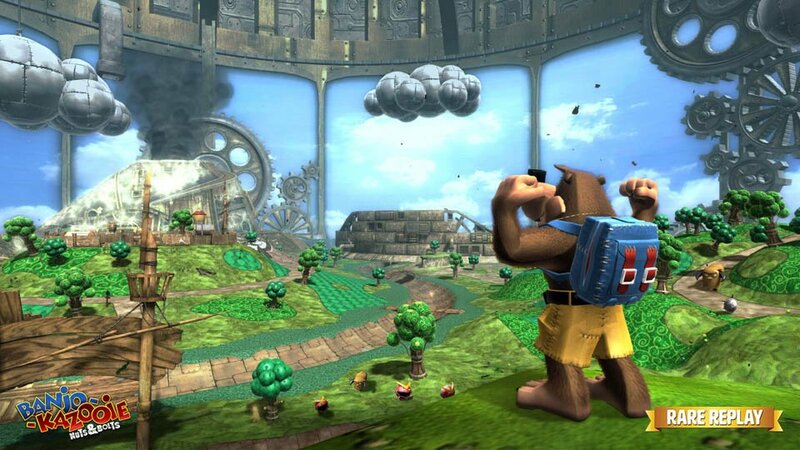 Of course, these are small complaints; Rare games such as Kameo, Perfect Dark Zero, Piñata and Nuts and Bolts may forever be overshadowed by their beloved predecessors on Nintendo’s platforms, but they were also among the first to usher console gamers into the HD generation and showcase its potential; no Rare compilation could be complete without them. Speaking of completion, this brings us to the only two flaws worth mentioning in the Rare Replay jewel. The first is that aforementioned Xbox 360 emulator allows for practically flawless backwards compatibility on Xbox One, but it’s not quite seamless. Essentially, firing up an Xbox 360 Rare Replay title kicks the player out of the Replay UI entirely and can take up to a minute before the Xbox 360 load-screen starts up, giving the transition a disjointed feel. 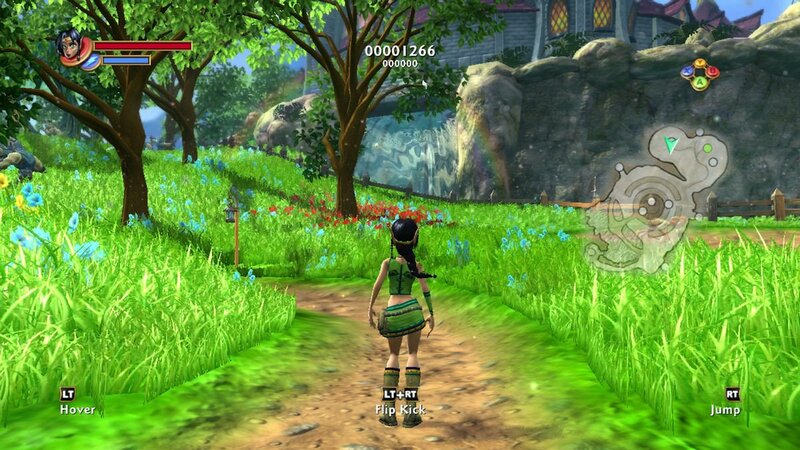 In fact, since each emulated Xbox 360 game actually exists as a separate title on the Xbox One’s hard drive, players can choose to jump right into the emulated game without even starting Rare Replay, but if they choose to skip that step and/or play the game offline it’s possible that Rare Replay Achievements tied to the game being played may not be tracked. Again, these are minor inconveniences in respect to the greater whole, but it still takes some getting used to the idea of a game anthology as a “digital bundle of separate products” (Steam and the PC says hello). And while no one would ever have expected any of Rare’s Donkey Kong Country games to appear on a Microsoft console (because, Nintendo), I think it’s still fair to ask “Where the heck is GoldenEye 007”? Anyway, here’s the bottom line: Anyone who picks up Rare Replay is going to feel as though they’ve actually stolen from Rare and Microsoft. Getting all these Rare classics for a buck apiece is tantamount to theft in this reviewer’s opinion. But upon playing this anthology, both Rare fans and the Rare-curious will also experience a product that is brimming with love, pride, and confidence in one’s brand that goes far beyond what we’ve come to expect from videogame collections. If you have an Xbox One and $30 burning a hole in your pocket, this is where it should be going. As mentioned earlier, Rare Replay is a celebration of Rare’s 30 years in the art and business of making interactive entertainment.